Science fiction flicks that don't make a lick of sense can compensate by offering a sufficient quantity of fun ("Back to the Future") or stylized weirdness ("The Matrix"). The humorless and derivative "Looper" has neither saving grace. This weak mashup of "The Terminator," "12 Monkeys" and the "Twilight Zone" episode "It's a Good Life" is only a dumb movie pretending to be smart. Joe (Joseph Gordon-Levitt) is a 2044 hitman who executes and disposes of mob victims sent back from 30 years in the future. It's apparently easier in 2074 to procure and operate an illegal time machine than simply to shove a body in a blast furnace, which is Joe's chosen method for getting rid of the evidence. The dubious explanation that some yet-to-be-developed tracking technology makes it harder to hide bodies in the future makes one wonder how even the most omniscient Big Brother hardware could detect human remains that are similarly cremated, or possibly dunked in concrete. Those in Joe's profession are called loopers because they know in 30 years they will be sent back in time themselves to be killed, "closing the loop" so they can't spill the beans on their paymasters. How loopers are kept from writing or recording extensive exposes of their exploits during the intervening years never is addressed. Neither is the concept of why anyone the mob hires in 2074 is deemed more trustworthy than longtime career men. Like everything else about the workings of this preposterous plot, its central driving element is stupid. Even worse, we are expected to believe that 30-years-older loopers are sent back in time to be killed by their 30-years-younger selves, who receive a bonus for carrying out that duty. This is proof positive that "Looper" writer/director Rian Johnson believes moviegoers who buy tickets to this mess are morons. He expects audiences to buy the idea that the brains behind the mob of the future haven't figured out two glaringly obvious facts: Sending old loopers back to be killed by strangers would eliminate any self-preservation temptations. And keeping things impersonal would save the mob a lot of bonus money by making those hits as no-strings impersonal as any others. The bad guys' bizarrely brainless policy eventually sends old Joe (Bruce Willis) back to be gunned down by young Joe. Even with unnatural makeup and prosthetics, Gordon-Levitt looks about as much like Willis as I do—and I don't. His odd eyebrows, strange smirk and sarcastic speech patterns are more evocative of a cockeyed Robert De Niro with a bad lip job than a "Moonlighting"-era Willis. Pursued by 2044 thugs, both Joes go looking for a five-year-old who will grow up to become a ruthless 2074 gang lord. Similarities to "The Terminator" extend to the fact that one Joe wants to kill him, the other wants to save him and the kid's mother is named Sara (although without an "h"). Old Joe has a cryptic number code pointing him toward three kids who could be The One. Don't even ask how he got that number, or why it's a number instead of a name. A blond Emily Blunt plays Sara with an oddly countrified American accent, but she manages to get a decent weeping exercise out of her thankless role. Paul Dano, on the other hand, goes full hambone with a histrionic crying jag as a desperate looper on the run. The third type is the completely ridiculous "anything goes" variety, where everything resembling credible cause-and-effect goes out the window. 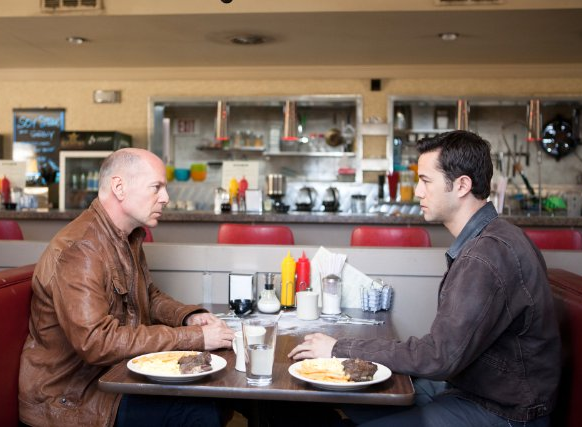 In "Looper," young Joe sends old Joe a message by cutting words into his arm that concurrently appear on old Joe's flesh as scars, instead of already having been there for 30 years. Another older looper starts losing body parts in mid-run when his younger self is dismembered elsewhere in town. Similarly illogical looper bloopers abound. Looks-wise, this is yet another SF film marred by almost constant horizontal blue-line lens flares. Even a well-lit bedroom scene doesn't escape unscathed. Don't waste time trying to put the plot's paradoxical puzzle pieces into place when the end credits roll, because the movie's writer/director clearly didn't. This may be the most poorly thought-out movie of the year, beating even "Abraham Lincoln: Vampire Hunter" (him again!) for that dishonor.